Suppose a new GNU/Linux distro ISO image comes out without torrent. For example, deepin is known to be like that. You have downloaded the ISO and made sure it matched official checksum. 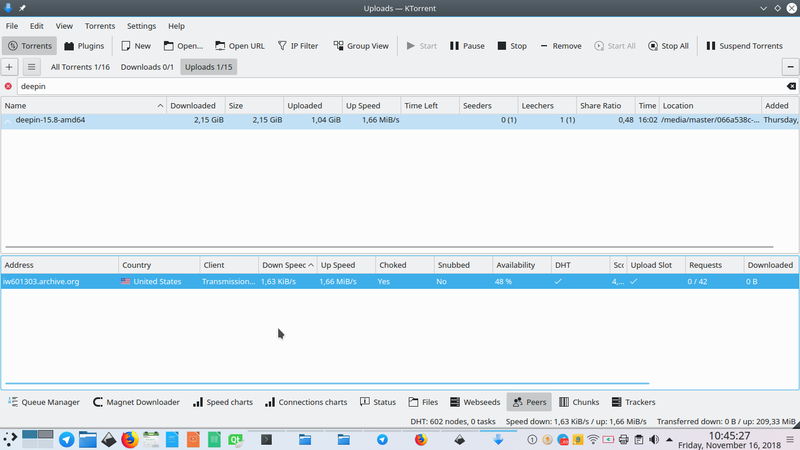 So, how to publish torrent download for this huge ISO you have? Actually it's very simple, just use your BitTorrent client program to create a .torrent file and share this file to the internet! 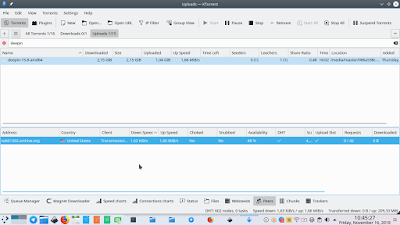 This article shows how to do it easily with KTorrent on KDE neon operating system. Despite that, you can also exercise this tutorial on any other OS as well. Enjoy sharing! 1) The ISO file URL, usually in HTTP. 2) The checksum value, usually in MD5SUM or SHA256SUM. 3) Mirror URL of the ISO, one or two is already good. 4) A torrent tracker URL, get the best list here. 5) Where you saved the ISO in your computer. You better look for some mirrors, that is, alternative source of download against ISO file you want to share. For example, worldwide ISO mirrors of deepin listed here. (See also other examples: worldwide ISO mirrors of Ubuntu listed here, Trisquel ISO mirrors here). What you need to get is an exact URL of the ISO image you want to share. 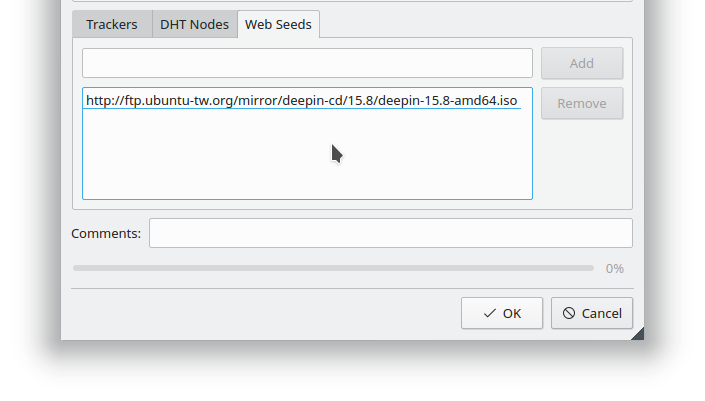 For example, for deepin 15.8, an URL from Ubuntu Taiwan is this http://ftp.ubuntu-tw.org/mirror/deepin-cd/15.8/deepin-15.8-amd64.iso taken from the list above. This mirror URL is important so while you turned off your computer, people can still download it (and later re-seed it) from the mirror instead from you. This is called webseed. I use KTorrent here. If you use Transmission, Deluge, qBittorrent, or other BitTorrent client, the way to do should not differ too much. 1) Go to menu File > Create New Torrent. 2) A dialog appears asking for the folder, the torrent trackers, and the webseeds. 3) Select the folder containing the ISO you've prepared. 4) On the Trackers section, add one torrent tracker URL, for example udp://tracker.coppersurfer.tk:6969/announce. If you can add more, that's better. 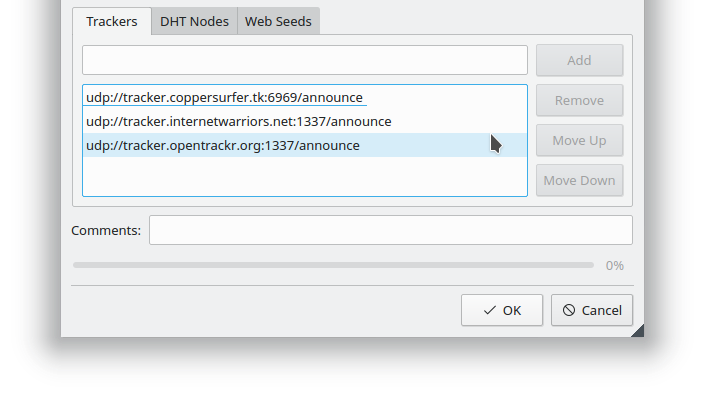 5) On the Webseeds section, add one alternative HTTP download link. If you can add more, that's better. 6) Save the .torrent file. For example, if the iso is deepin-15.8-am64.iso then the filename is deepin-15.8-am64.iso.torrent. A file with .torrent extension of some KB created containing the information of your actual file location to be downloaded. 4. Share Your Torrent File! Upload it to your social networks, to Telegram groups, to Reddit, or any other way you have so your friends could download it. Or, see Better Way section in the end. When a user downloads that torrent, you will upload the actual ISO file to that person. This is the sharing session. This is called seeding. Finally once it's downloaded by other person, the number of person sharing same file is now increased. You can ask more friends to join sharing!